If you’ve been keeping up with development progress, you’re probably aware that I’ve been doing some playtesting in preparation for making the next release. Sometimes, playtesting results in relatively small balance tweaks or content and mechanics adjustments. Other times, one finds themselves redoing the economy system for – if I’ve been keeping track correctly – the 5th time. So, that’s what I want to talk about today – briefly! – before diving back into the depths of my TODO list. The good news is, this iteration of the economy 1) is simple, 2) keeps most of the elements of the previous one, 3) is based on colony playtesting, so is likely to actually really stick this time, and 4) as of this writing, fully implemented. This ended up being roughly a week-long detour, by the way, so, all things considered, not too bad. That is: why rip out the guts of the economy again? It’s about the last thing I wanted or expected to do, but doing actual playtesting with colonies made it clear the previous system just wasn’t good enough. Mainly, it was just too complicated – multiple screens to keep track of colony-to-colony “accessibility” relationships, and then figuring out ways to nudge said relationships a few points to become a supplier and get profits from exports. And, hopefully, the final one. We’re keeping just about everything – having units of production and demand and so on works nicely and is something that events and player actions (such as piracy or missions) can play into. What’s getting taken out is the system of having colony-to-colony accessibility, and the concomitant approach of finding the best supplier for a commodity. Instead, each colony has a single accessibility rating. It’s based on its proximity to other colonies, having a spaceport, relevant administrator skills, hostilities with other factions, and so on. All demand for a commodity across the Sector – let’s say, Food – is added up to produce a “global market value”, that is to say, the amount of profit that’s to be had through Food exports. Likewise, all Food production is totaled up, this time also modified by each producer’s accessibility. A “market share” is calculated for each Food producer, which determines the portion of the global market value it receives as income from exporting that commodity. Accessibility also limits the amount of a commodity that can be shipped out or brought in, so, for example, an inaccessible market that produces 10 units of Food might only be able to export 3 units, and for anything it needed to import, it’d be limited to only 3 units as well, possibly resulting in shortages. 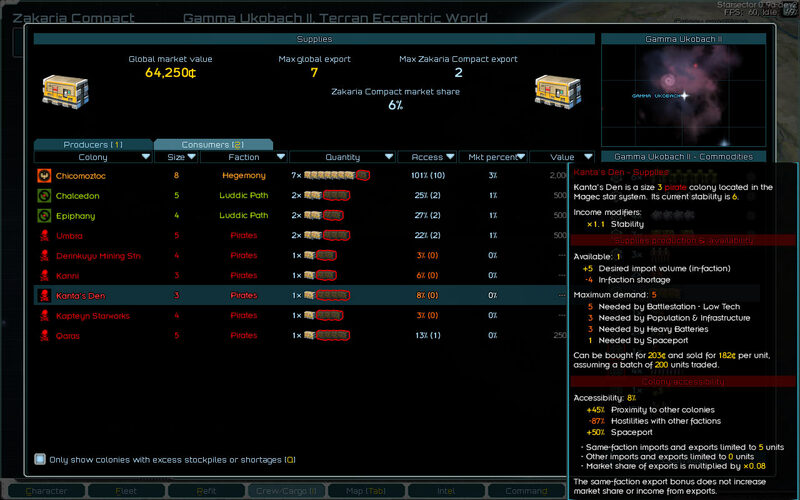 In-faction accessibility is boosted by a certain amount, meaning that if there’s a high supply of something in the same faction, it’s easier to get a hold of – though this doesn’t generate additional income from exports, but rather represents the ability of a faction to offer not-for-profit logistical support to its colonies. 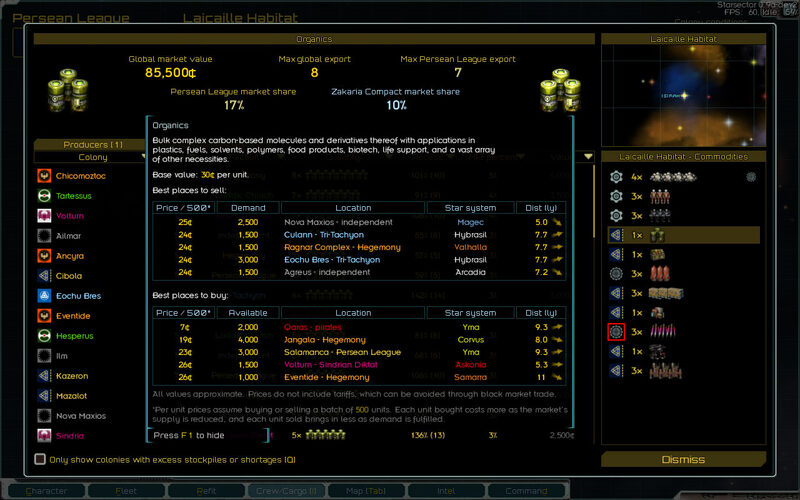 This results in a dynamic system where changing hostilities between factions can create shortages and excess stockpiles, giving the player opportunities to exploit. 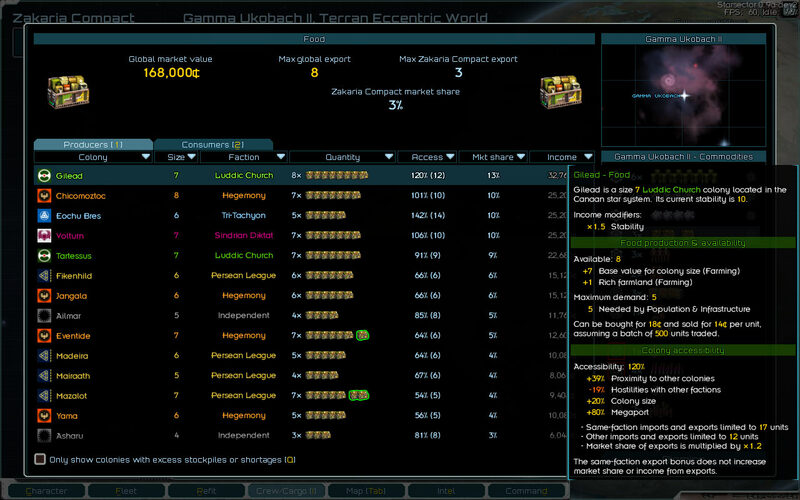 More importantly, however, it has some very nice properties as far as the player’s colonies go. 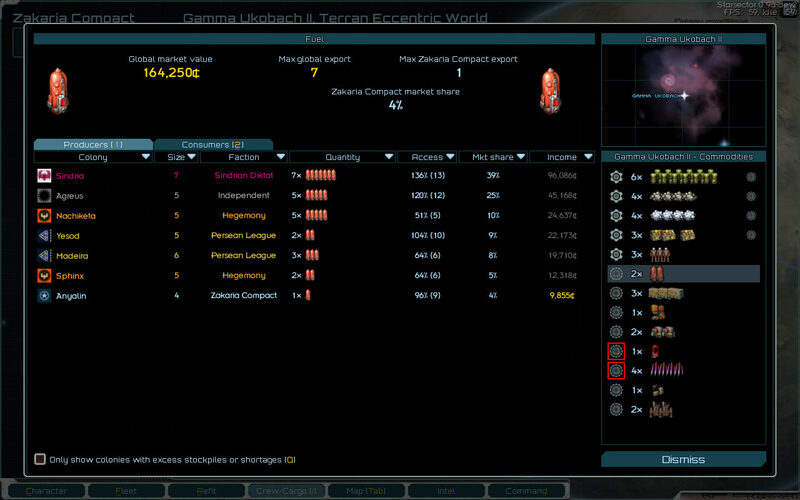 First off, making some credits on exports is easy. Found a nice planet with Ultrarich Ore Deposits? Get a mining operation going, and you’ll start to make some credits without having to pore through colony-to-colony connections to identify a possible customer. It’s a lot easier to get a slightly-profitable colony off the ground! Second, producing more of a commodity is always good – it increases your market share and therefore income. There’s no longer such a thing as having too much production. Third, there are no hard cutoffs (as there were in the previous system) where an extra point of accessibility could mean a huge difference in income, due to being the best supplier for something – or not. It’s also much harder to make completely unreasonable profits by stacking accessibility – instead of becoming the best provider for everything everywhere, you’d “just” have increased market share. It’s clear that Sindria is the main producer of Fuel in the Sector, and that there’s not much in the way of other producers. This makes it a market prime for cracking into – almost any amount of Fuel production will get significant market share. And if something unfortunate were to happen to Sindria’s spaceport, nuking its accessibility for a time – or if a raid was to get a hold of the Synchrotron Core powering its production – the potential profits are eye-watering. This entry was posted on Friday, October 5th, 2018 at 6:13 pm	and is filed under Development. You can follow any responses to this entry through the RSS 2.0 feed. Both comments and pings are currently closed.